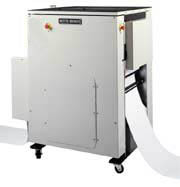 The Dual Selectable Perforator and the Quad Selectable Perforator run in-line with continuous output printers, and have the ability to add cross perfo-ration, at a preset point, to any page within the print run. Adds line holes and page perforation to stock paper. Attaches in-line between roll unwind and printer.